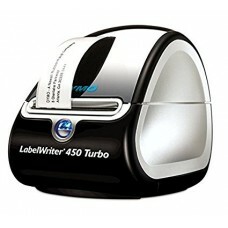 The Dymo Turbo Label Thermal Printer prints up to 70 labels per minute. Compatible with both Windows and Mac OS X, the Dymo Turbo Label Printer makes high speed printing available to users of nearly all computing backgrounds. Using inexpensive thermal ink, a user can print address, folder, shipping, and barcode labels on the Dymo LabelWriter 450 Printer, obviating the need for costly traditional inks. The printer also offers a break from the bland homogeneity of most labels; the screen on the Dymo Turbo Label Thermal Printer permits the user to select various layouts, enabling him or her to find the theme that best fits the label’s purpose. The Dymo LabelWriter 450 Printer additionally permits users to print addresses that have been stored in popular document and e-mail programs, meaning users can avoid the tedium of retyping such information when they print labels. The clarity of the finished product produced by the Dymo Turbo Label Printer measures at 600x300 DPI, a quality level that ensures bar codes will scan correctly, and that graphics will stand out. To conserve power the Dymo Turbo Label Printer has a sleep mode that engages when the device has been out of use for an extended period.